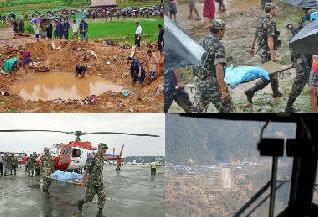 August 25, 2010 - On Tuesday, Nepal's air carrier Agni Air, operating a German built Dornier 228 turboprop twin engine airplane, Flight AG-101 crashed in heavy rain on approach to Simra Airport killing all 14 onboard. Flight AG-101 had departed Tribhuvan International Airport in Kathmandu at about 6:30 AM local time and was to land 7 AM local time at Tenzing-Hillary Airport (Lukla Airport), Lukla, Nepal. Enroute the pilot was informed by air traffic control that Lukla Airport was closed due to severe weather and poor visibility. The pilot was advised to return back to its departing airport. Lukla Airport, located in the Himalaya Mountains it is considered the most dangerous airport in the world, due to its short runway and the unforgiving approach path to its perch high. The pilot, Captain Laxman Prakash Shah, and copilot Sophia Singh headed back to Tribhuvan International Airport, enroute the weather conditions become unfavorable, the Captain decided to land the 15-seat Dornier 228 at Simra Airport. Flight AG-101 collided into a hillside about 50 miles south of Katmandu, broke up into several pieces and burst into a ball of fire. Nepal, officially the Federal Democratic Republic of Nepal, located in South Asia, Civil Aviation Authority spokes person, Tri Ratna Manandhar confirmed that all three crew members and eleven passengers were killed in the crash. Rescue efforts were initially hampered by a monsoon rainfall. However, Nepal Army (NA), Nepal Police, Civil Aviation Authority of Nepal (CAAN), and Nepal Red Cross Society (NRCS) were able to reach the crash site by helicopter and on foot. The some of the chard bodies and body parts were collected and taken to Katmandu hospital on Tuesday. The rescue team will remain at the site today (Wednesday) to collect the remaining bodies and comb through the wreckage to determine what caused the crash. A five member committee has been formed under the Ministry of Tourism and Civil Aviation to investigate the crash of Flight AG-101. The committee will submit its report within 65 days. Lukla airport (Tenzing-Hillary Airport) is popular since Lukla is the place where most people start their climb of Mount Everest. There are daily flights between Lukla and Kathmandu during daylight hours and good weather. Although the flying distance is short, it can easily be raining in Lukla while the sun is shining brightly in Kathmandu. The paved tarmac is only accessible to helicopters and small fixed wing short takeoff and landing (STOL) aircraft such as Twin Otters or Dornier Do 228. There is about a 700-metre (2,000 ft) angled drop at the end of the runway to the valley below. The airport is contained within a chain link fence and patrolled by the Nepal armed police or civil police around the clock. In January 2008, the airport was renamed in honor of Sir Edmund Hillary and Sherpa Tenzing Norgay, the first persons to reach the summit of Mount Everest. Sir Edmund Hillary died on January 11, 2008. Tenzing Norgay died in 1986.